Curtains have many uses as they add privacy to your home, prevent light from entering the room, and also bring in color to the décor. The curtain is not just the piece of fabric hanging on the window or door but it is well-designed piece of furnishing that completes the home décor. The color, design, and stitching of the curtains would depend on many factors as given here. Why you need a curtain? The curtains have both functional and aesthetic value. If the curtain is to be selected only for adding aesthetic value to the décor then you need to select the color and texture that goes well with the color scheme of the room. Don’t think about any other functionality while selecting the style and fabric of the curtain if it is purely meant for decoration. When the curtain is selected for its functional value then your selection would be based on following points. – Light Prevention – The prevention of light from entering the room is the major function of any curtain. Some people want the room dark during their daytime power naps while some want some light to enter through the curtain. 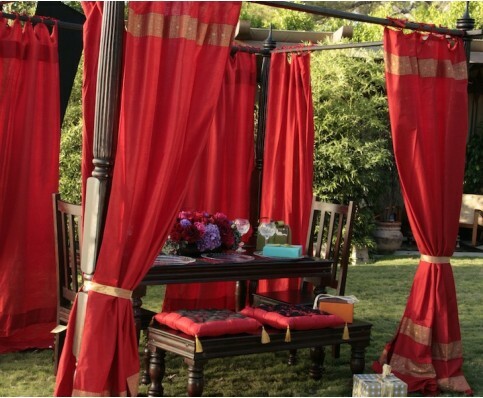 The thick and dark colored fabric can be used for the curtain to get the darkness even during the daytime. For more light, you can go for lighter shades. Use layered curtain to have benefit of both. Here one layer would be thick and dark for complete light prevention, while another layer of thin and lighter shade fabric would allow the light to enter the room. – Length of Curtain – After the decision of fabric is made, you have to decide the style and length. There are no set norms for the curtain length. The curtain falling on the floor would look elegant but at the same time it would catch up dirt and dust faster. Those having pets and kids at home may refrain from keeping floor sweeping curtains. Keep it above the floor level by inch or two. The window curtains may be kept at least 6 inch below the windowsill level and if you wish then full length curtains for windows can also be designed to cover the entire wall. – Fabric and Lining – Lining in curtain is quite important as it provides thickness to the fabric and also keeps the curtain in place. Lining will protect the curtain fabric from outside dust. The effect of sunlight would also be reduced keeping the fabric color away from fading. – Samples may mislead – The curtains are selected from the fabric samples that are very small to give an idea of the original print. The print in 6 inches X 6 inches sample may not give the same effect as it provides in the form of a curtain. Look for the original sized samples, though not stitched to get the actual picture. Keep the curtains last in your decoration process and start with rest of the designing as this will guide the selection process better.